Deschutes is a great model of how to grow a craft brewery. They manage to have a solid lineup of year-round beers paired with outstanding special releases (Abyss or Dissident, anyone?). They continue to impress both average beer drinkers and beer geeks alike. As a result, demand for their product continues to increase and they are planning to expand their brewery headquarters in Bend. 15 March 2011 – Bend, Oregon – Deschutes Brewery today announced that it has finalized plans to expand its brewery headquarters in Bend, Oregon. Due to customers’ continued consumption of the brewery’s damn tasty beers, Deschutes plans to add 6,750 square feet to its production facility, which will include five new shiny fermentation tanks and a fresh remodel of the tasting room and gift shop. Specifically, this project will create a new building to house the fermentation tanks, a new two-story building to house future processing equipment, an electrical control room and new restrooms and showers for the staff. The expansion will allow Deschutes Brewery to brew an additional 105,000 barrels per year, along with enhanced processes to continue ensuring beer quality and consistency. This will be the first phase in a two-phase expansion. The second phase will take place in several years and include five more fermentation tanks. Water and energy efficiencies are built in to the new design, including the installation of a continuous use cleaning system and the addition of a water re-use tank which will save thousands of gallons of water and energy per year. Additional sustainability features include a heated warm rinse tank, which will save hot water and steam for tempering tanks between cycles. The brewery will continue with designs to capture CO2 from the fermenting process and decrease waste to the City sewer system. Local firms BBT Architects and R&H Construction are designing and building the project, and Walker Structural Engineering is completing the structural design. Construction on the space is slated to begin mid-May 2011 when engineering is complete, and will be finished in mid-2012. 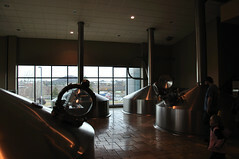 Visitors will still be able to easily access the brewery for tours, tastings and merchandise during the construction process.